If you would like to have your cake recipe and photos posted on this site, simply fill out our cake submission form. Please provide detailed step-by-step directions for making your cake. I’m sure our website visitors would really appreciate you for providing them with great recipe ideas. Cake Submitted by Kyrie S. from Nanaimo, British Columbia. I made this cake for a friend’s daughter’s fifth birthday. 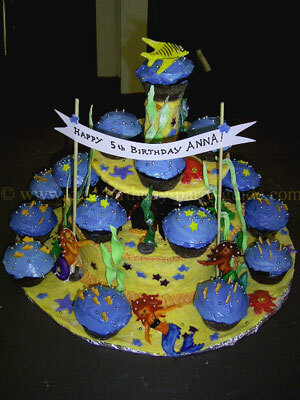 All the decorations are made from fondant. I drew the mermaids on paper, then cut them out of thin fondant with an Exacto blade knife, tracing over the paper. I painted them with food coloring. Beat well and pour into any prepared (buttered and floured) pans. Bake at 350°F, about 20 minutes or until toothpick comes out clean. Whisk 3 cups extra fine white sugar and 12 egg whites in a double boiler over simmering water. Remove from heat when sugar has dissolved and mixture is hot (but not cooked). Beat mixture until peaks form (like meringue). Slowly add 4 cups of softened butter, cut into chunks. Continue to beat until the frosting comes together. Add any flavorings or colors. Stir until there are no air bubbles remaining.